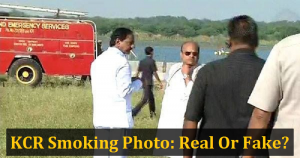 Telangana CM KCR Cigarette Smoking Pic At Vijayawada Goes Viral On Social Media, But Is It Real or Fake? Telangana Chief Minister KCR had gone to Vijayawada to invite Andhra CM Chandrababu Naidu for the Ayudha Chandi Yagam he’s been planning. Both the Telugu CMs greeted each other affectionately and Chandrababu even arranged a sumptuous lunch with special Andhra delicacies for KCR. However, here’s one photograph that is going viral on Facebook & Whatsapp since yesterday. 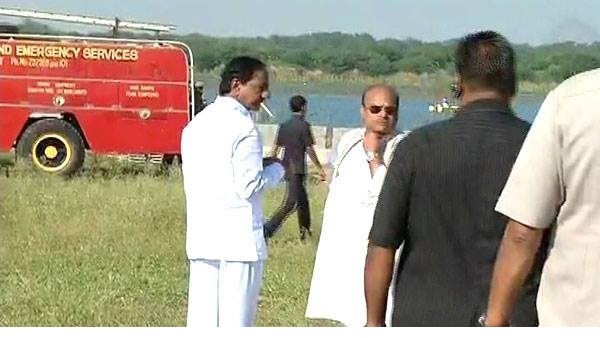 The photograph shows the Telangana CM allegedly sticking a cigarette in his mouth and about to light it up on the banks of River Krishna before he flew back to Hyderabad. KCR Smoking Photo: Real Or Fake? KCR is seen speaking to AP state’s Minister of Finance Yanamala Ramakrishnudu while waiting for the his helicopter. But many say that the Telangana CM was not smoking and there was a white still rod in the background and the photographer clicked it in a very tricky way to make it look like smoking.